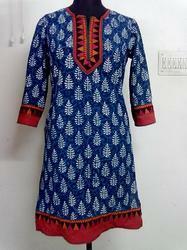 Hand Block Printed Kurtis Manufacturers, Wholesaler, Suppliers in Sitapura Industrial Area, Sanganer, Jaipur. 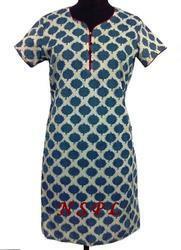 Reckoned in the market as a manufacturer and wholesaler, we are engaged in offering Indigo Hand Block Printed Kurta. Demanded by fashion conscious ladies, these kurtas are designed as per the prevailing market trends. Post-production, these kurtas are checked on the basis of tearing strength, colorfastness and stitching to ensure flawlessness. Being a client-centric organization, we are engaged in manufacturing and wholesaling a wide collection of Block Print Kurtis. Mesmerizing in designs and attractive in patterns, our offered kurtis enhance the look of the wearer in an aesthetic manner. Using quality-approved fabrics that are obtained from the reliable vendors, these kurtis are designed and developed. 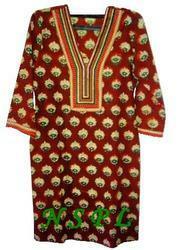 As a reliable manufacturer and wholesaler, we are engaged in offering our clients with Hand Block Print Kurta. Ideal to wear in all seasons, our offered kurtas are designed as per the latest trends of the market to attract huge clientele. Under the observation of skillful designers, these kurtas are designed in various color combinations and patterns to suit the demands of esteemed customers. We have earned a reputed position in the domain by manufacturing and wholesaling Bagru Printed Kurti. Fashionable in nature, these kurtis are developed by making use of superior-grade yarns and fabrics that are obtained from the celebrated vendors of the industry. With the support of vast distribution network, we are able to dispatch our range on-time to the customers' premises. 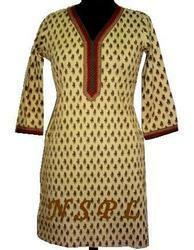 Being an eminent organization, we are engaged in manufacturing and wholesaling Dabu Printed Kurti. Our offered kurti is demanded by fashion conscious ladies as is designed as per the prevailing market trends. Provided in different sizes and designs to choose from, our offered kurtis are widely demanded across the nationwide market.